UBTER JEEP 2018 dates have been released for Joint Engineering Examination Polytechnic (JEEP 2018) for new batches UK Polytechnic. The registration process for appearing in Uttrakhand Polytechnic has already started from 1 January 2018, and it will continue until 15 March 2018. All the candidates who seek admission in polytechnic through UBTER JEEP 2018 for engineering and non-engineering courses can apply from here. 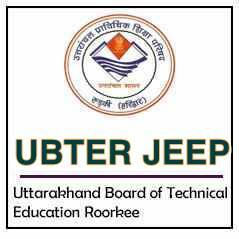 UBTER - Uttarakhand Board of Technical Education Roorkee conducts Joint Entrance Examination Polytechnics (JEEP). UBTER was setup in 2003 and conducting Joint Entrance Examination for admission in Engineering & Technology, Diploma in Pharmacy, Hotel Management and Catering Technology, Modern Office Management & Secretarial Practice, PG Diploma in Computer Application, Textile Design, Garments Design, Fashion Design, and Lateral Entry Courses (for admission in 2nd year of engineering)– Group (E). Scroll down to get the complete details of UBTER JEEP 2018 Application, Dates, Courses, Seats, Institutions etc. Age: There is no age restriction to apply for the same. Academic Eligibility: For different courses candidate has to meet with certain criteria in order to seek admission. Check the complete list down below. Obtained at least 35% marks in 10 or its equivalent exam. Candidates can complete the online form filling process by going through the link given below. The cost of Application form including counselling fee and examination fee is Rupees 500 for SC/ST and Rupees 800 for General and other castes. UBTER JEEP Application Form 2018 - Apply Online! Step 1: Click on the link and select the group name. Step 3: Submit the fee or fee receipt. Payment is made online only through Debit card/ Credit card/ Net Banking. Step 5: Print confirmation page. Submission of UBTER JEEP 2018 application or registration form will be online. Candidate need not send any documents or application form to UBTER. However, the candidate is advised to take print of both fee receipt and confirmation page as both is important in order to the future occurrence. Before submitting the fee, the candidate is advised to check form carefully and if any mistake is found he/she can edit it. The Applicant can submit fee by Online, the Applicant can pay the fee via, Debit Card / Credit Card / Internet Banking. Applicants are advised to keep with them the copy of the "Online Fee Receipt" as a token of remittance fee for future reference. Candidate can download the Admit Card for UBTER JEEP 2018 by following the given link. Candidate is advised to check all the details printed on the admit card and also check the examination center. Please keep in mind, admit card will not be sent to candidate through mail or post, it is available online only from mid of April. However, candidate will be informed via SMS on their registered mobile number. Candidate has to submit the fee online through Debit card/ Credit card/ Net banking. Following are the list of fee for candidate in different categories. The Application fee includes all the fees like counselling fee and examination fee, candidate needs not to pay any other fee. UBTER JEEP 2019 Annual Fees structure in Government, Aided, Urban Areas and Woman polytechnic. Private colleges’ fees may differ according to their policy. The above fees structure is only for government polytechnic. The announcement of result and rank will be on the website on 20 May 2018. All the candidates are advised carry all the original documents at the time of counselling. The date of counselling will be updated on the website or will be published in the newspaper as well. No post or mail regarding counselling will be sent to the candidate. It is advised to check the website on regular basis. Note: candidate needs to preserve the admit card till the time of admission. Mode of Exam: Pen and paper. Subjects: It varies according to the course is chosen by the candidate. Syllabus: Different courses has different subjects question in the polytechnic examination. Check the complete list given below course wise. Given below are the courses for which the JEEP 2018 Exam will be conducted, The Courses along with the branch code is given below. UBTER JEEP Admit Card 2018 - Released!